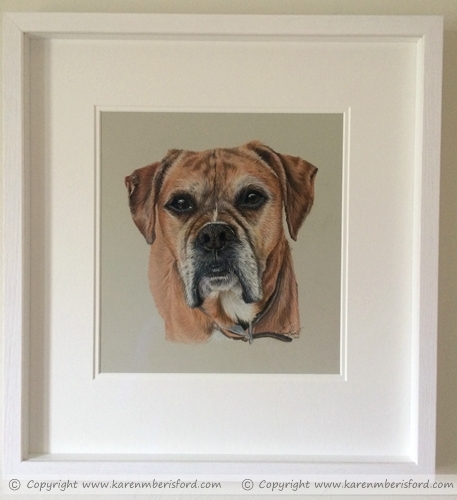 ​This portrait was ordered as a Birthday gift of their beautiful Boxer who has sadly now crossed the Rainbow bridge. I was sent a collection of photographs of Max so I could choose the one I thought would be the best reference photo, as soon as I saw this one, I knew it was the one. I just loved the sun sparkling in his eyes and I knew his sparkle would 'make' the final portrait. As the photograph of Max was taken on a sunny day, there were strong shadows on the right side of his face which changed the colour tones - using the colour tones in the left side of his face, it was easy enough to adapt for an over all balanced appearance. Both the Commissionee and myself decided it would look more natural if Max's mouth was closed on the final Artwork, so working with another photo of Max that had been provided, this was also a relatively simple adaptation, resulting in the final portrait you can see above. 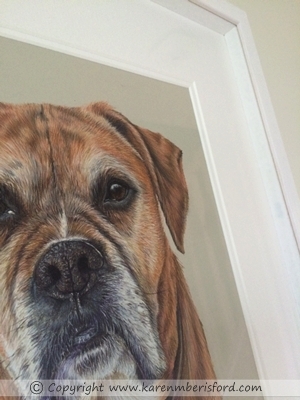 Hi Karen, Max is absolutely amazing, it has literally just put tears in my eyes it's absolutely perfect!!!! I can't believe how realistic he looks I'm so so over the moon with it thank you so much!!!! Here is the framed portrait that I feel really compliments a portrait such as this. The simplicity of the white double mount and deep frame coupled with non reflective glass ensures Max is the main focal point of the finalised piece. I think the Commissionee's framer did an excellent job. 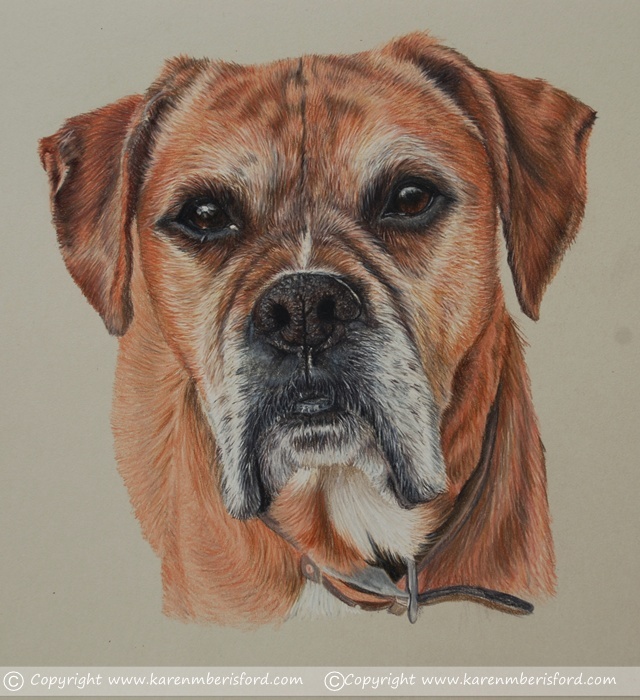 Max's portrait was also included in the double spread Gallery page of the USA's Colored pencil Magazine when I was the featured Artist (June 2015) - With Thanks to Louise for allowing the use of Max's portrait. The magazine was purchased by Louise and presented with the final framed portrait.